Yes that’s right book fans, it’s still Children’s Book Week. Today I’m looking at books for older children (i.e. children who can read for themselves). As before these are books I enjoyed as a child. Apart from the adult books obviously. I think I have read more or less every children’s book by Roald Dahl. I am still a particular fan of Charlie and the Chocolate Factory. 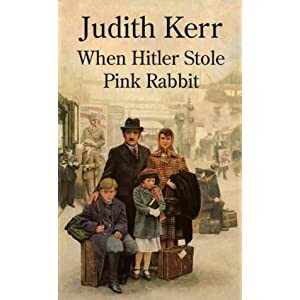 I just loved the idea of a chocolate factory being like that, and I loved reading about the horrid boys and girls. I wanted to be Matilda though! I remember being disappointed in the Matilda film because it didn’t have my favourite scene from the book, where Matilda puts the parrot up the chimney. Jacqueline Wilson was my favourite author for quite a few years. I read everything written by her up until I was about 12 and after then I read Falling Apart (which was more of a Young Adult novel, and now I think about it pretty depressing) a couple of times as a teenager. I always say I was a fan of Jacqueline Wilson before it was cool. I even wrote her a letter, and I still have the reply she sent me. My favourite Jacqueline Wilson book was probably The Lottie Project which I liked for it’s historical bits and its issue-y bits. This book was one I kept borrowing from the library again and again. I really don’t know why I never bought it. Maybe because at the time I only got 50p pocket money a week. It would never have occurred to me to buy my own books when I could go to the library or ask my parents to buy them. And even then I rarely asked my parents to buy things for me, or at least things more expensive than a pack of sweets. Anyway the book. Special Powers is about a girl, Emily who is a pretty normal girl, boring even. She brings excitement to her life by imagining a fantasy land where she is queen. One day she meets a girl who has just moved to town with her strange family and her fantasy starts to seem more realistic. Special Powers is the first fantasy book I can ever remember reading. 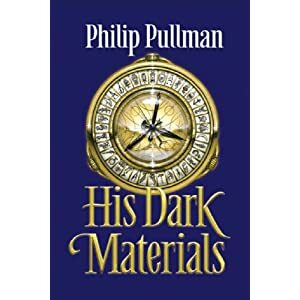 Although I’m not the biggest fan of fantasy anymore it still holds a special place in my heart, and this book lead me to some of my favourite books. To this day Northern Lights remains one of my favourite books (while I enjoyed the others I liked Northern Lights the best). I love the characters, all off them. Especially I loved Lyra, and Mrs Coulter and Lord Asriel were both fascinating. For a while I even considered that I might name one of my children Lyra. I would recommend these books to pretty much anyone, adult or child. I even managed to convince a few girls in my English class to read The Amber Spyglass one year when it was a nominee in a children’s book award (it didn’t win but if everyone else was put off by the size of it, like many in my class were, I’m not surprised). I used to get teased by my sisters for reading these books. When I was a kid it really wasn’t cool to like Enid Blyton. The Famous Five was still popular but I always refused to read them because I didn’t want to read the popular ones (even now I often shy away from books which are very popular). I liked them though. They were exciting. I didn’t read them in order, but I don’t think it really mattered. 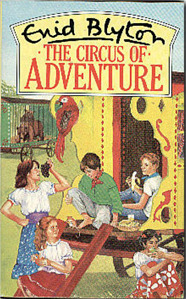 I started off with The Circus of Adventure, and, maybe because I owned it and got to re-read it, it was my favourite. Oh and I liked the parrot (Kiki) and that one of the characters was called Lucy-Anne which is my name and my sister’s name together (Simple pleasures!). I also read all the Secret Seven books and particularly liked that one of the characters had a pet monkey. I do not think I need to do more than mention my love of Harry Potter. I could not even link you all the posts for it! But if you type Harry Potter into the little search box on my sidebar you will find plenty! Or click the link and you will find out about my relationship with the Harry Potter books. I feel I am missing so many books out but still special mentions go to. Heaven Eyes. Woof! Bill’s New Frock. The Family from One End Street. The Hobbit. The Peppermint Pig. The Sophie Books. Moondial, The Worst Witch, The Horrible Histories books, Witch Child. Lucy, how good that Special Powers meant a lot to you! I enjoyed writing it. It was re-issued recently by Barn Owl Books with a much nicer cover and I updated some of the references; otherwise it’s the same text. Mary, thank you for visiting, and for writing Special Powers! I may have to look up the new issue, I have always wished I had my own copy.